Facebook has a privacy center that offers even more privacy options, and reintroduced some of the older, lesser-known security settings. This article will round up the most important new privacy options, including a few that Facebook had buried until now. 1. Approve tags before they’re published. Facebook finally lets you approve tagged photos and posts of you before they land on your profile. How many times has a friend tagged you in an unflattering photo? It’s time to end these actions. Go to Account > Privacy Settings and select Edit settings next to “How tags work.” Then hit Edit next to Profile Review and you’ll be prompted to turn on the settings. Now, every time someone tags you in a status, photos, or place, the post will appear in the Pending approval section on your profile. Once you write your status, click on the small triangle next to the Post button to make the post visible to: friends, public (anyone on the Internet), or custom (exclude individuals or lists). To change the visibility after you’ve posted, head back to the post on your wall, hover over it, and click the drop-down menu in the upper-right to change the visibility. It’s much easier to change the privacy for every element of your profile. You can share your hometown with everyone, but your birthday to just your friends. Or, make it so that only close friends can see who you’re in a relationship with. Go to your profile and select Edit profile at the upper-right corner of the page. Then head to one of the categories and change the privacy of its elements using the drop-down menu next to each field. Head to your privacy settings, and scroll down to “Control your Default Privacy.” Here, you can select the default audience for all your posts–Public, Friends (all your friends), or Custom (exclude certain friends or lists). Once you make all the privacy tweaks, see how your profile appears to certain friends or anyone on the Web. Go to your profile and select “View profile as…” in the upper-right corner. Enter a friend’s name or select the public link in the instructions above the field to see what it looks like to everyone. Protect your Facebook account since it’s the most famous social network with most users. Imagine you lost your Facebook password, don’t panic, turn to Password Recovery for help. After weeks of testing by developers and early adopters, the final version of Mozilla’s Firefox 23.0 has been released. The new release brings improved security with mixed media content blocking and easier sharing with the addition of a new dedicated sharing button. On the desktop, the new release mixed content blocker prevents insecure content from being compromised on otherwise secure websites. It will prevent “man-in-the-middle” exploitation of active content such as scripts on HTTPS pages. Users will have the option to disable the blocker if they start to find it annoying. There’s also a new network monitor for developers, more options to switch search providers and numerous monitor tweaks. Recently Firefox added the ability to integrate a number of social sites like Facebook, Cliqz and Mixi into a persistent sidebar in the browser. With this release, Mozilla is also finally dropping support for the <blink> element from the stable version of its browser. On OS X, Firefox now also supports the new scrollbar style. Upgrading your Firefox into version 23 may improve your experience of using Firefox. What’s more, having a Firefox Password Recovery in hand can give much better improvement of this experience once you forgot the user names and passwords to websites saved in Firefox. We all know that it is easy to get back your lost Facebook password if you remember the email address that you used to sign up for your Facebook account and your mobile phone number listed on your Facebook account. But what if you happen to forget the email password and the mobile phone number listed on Facebook account you haven’t been used for a long time. This may be a rare situation, but we should admit that it really exists. How to recover Facebook password without email and the phone number? This article will introduce three ways. First, on the page of “Reset Your Password”, you need to click the link “no longer have access to these?” , then provide a new email that has not be used to sign up for any Facebook account. Just like many other sites using a simple way to regain access to you account by asking you to answer one or more security questions, Facebook will display you security question. If you answer the security question correctly, you will be prompted for a new Facebook account password. After entering the new password, Facebook will send an account recovering to your new email address. Click that link; you will see the congratulation message: “You’ve successfully confirmed your identity”. Second, there is a new security feature in Facebook – “Trusted Friends”. It can help Facebook users to get their Facebook account back without their emails. It is a new method to prove who you are by contracting your friends when you are completely locked out. This feature lets you appoint 3 to 5 friends on Facebook whom will be contracted by Facebook later on. The social network will send a code to each of these friends. You will be required to enter these codes to open your locked account. Third, you can also choose to get back your email password first, and then use it to get back your Facebook account. Recover email password may be something difficult. But if you use outlook express, I recommend you try outlook express password recovery tool you can recover your forgotten email password within minimum of the time. After get your access to your email you can easily get back your Facebook account password. All the three methods offer a nice way of restoring your forgotten password when you lose Facebook passwords account and email account. For the first way, after proving your identity, answering a security question, selecting a new password, and recovering access to your account, the Facebook will says “For your security, you must wait before you can access your account. ” you must wait a whole day before you can log in using your new email and password. And the second method is much slower than the normal password reset method. If both of the first two are not work, you can try the third one. Complicated it may be , but it is still a good thing that you can get back your Facebook password without the email address and the mobile phone number no matter how much time it may take. Facebook can be one of the most popular networking services nowadays. As of September 2012, Facebook has over one billion active users. Here people can communicate with friends and other users through private or public messages and a chat feature. They can also create and join interest group and “like pages”. We can see that Facebook has become an indispensible part of many people especially young people’s life. With the popularity of Facebook among people, another problem appears that is forgot Facebook password. If you happen to encounter the same problem, you come to the right place. Here I will tell you how to get back your lost Facebook password in detail. If you are having trouble logging in to your Facebook account, before assuming that you forgot your password, check the Caps LOCK Key. Facebook passwords are case-sensitive. Turn off the Caps Lock, and try again. It might be a cookies problem. If cookies are disabled in your browser, you may be returned to the login page even after entering the correct password. If you use Internet Explorer click on Tools/Internet Options/Privacy and change the setting to Medium to allow cookies. If you are Firefox users, you can click the Firefox button, go to Options / Privacy, select the “Use custom settings for history” option, and check the “Accept cookies from sites” box. In Google Chrome, you firstly need to click the wrench icon, then click Settings, and click Show advanced settings, and then click the Content settings button under Privacy. Choose the “Allow local data to be set” option. After reset your browser, restart it and try to log in your Facebook again. If both of the two ways above do not work, I afraid you really lost your Facebook password. Don’t be freak out! Just click the link next to the Facebook login button – Forgot Your Password? You will see the “Identify Your Account” interface. Enter the email address that you used to sign up for Facebook account and your username or the mobile phone number listed on your Facebook account. After you have done this, Facebook will send an email or test message describing how to reset your password. Actually, you cannot get your old password back, but you will get to pick a new one and you can access to your account again. Try to follow these three steps if you cannot access to your Facebook, I believe that you can get back your lost Facebook password. 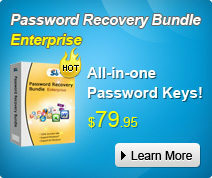 If you still cannot recover it, you can try password recover tool for log in. Password Recovery Bundle Standard is a comprehensive solution for recovering all Internet Explorer saved password even of you have deleted all IE history files. Yahoo email is used widely in Internet, many people usually forgot yahoo password, yahoo email, but that how to change yahoo password is cared about by many people. There are how to change your yahoo password. 1. Log in ;to your Yahoo Email account. 2. Click your name (in this example, User) in the Hi, User greeting at the top-left of the page. From the menu that appears, select Account Info. A new browser screen appears asking you to verify your password. 3. Type your password into the box and click Sign In. The Account Information page appears. 4. Type your Current Password in the first box. 5. Type your New Password in the second box. 6. Confirm your New Password by typing it again in the third box. 7. Click Save. Changing yahoo password is successful. Opera Password Recovery is a great tool for any user of Opera. It’ll instantly recover passwords for protected web sites and mail accounts stored in Opera. The program will recover only those passwords that have been stored by Opera. If you have lost or forgotten your password, the program will get it back to you instantly as soon as you start it. Step1. Free download Opera Password Recovery 5.0 and run it. Step2. Click “Start Recovery” button, and then a list of emails with sever address, login, passwords will be displayed in the box. Step3. Find out your Yahoo accounts, and passwords. If you want to change Yahoo passwords, then copy the displayed passwords and login into Yahoo, change the passwords there. The-above methods all can change yahoo password, but I suggest you select the second method, because it can save much time.